The physics-based tower building game. Physics-based tower building game Tricky Towers is coming to Switch via the Nintendo eShop on October 11 for $14.99 / €14.99, developer WeirdBeard announced. Pre-orders will include a 20 percent discount. All of the game’s free and paid downloadable content will also be available at launch. 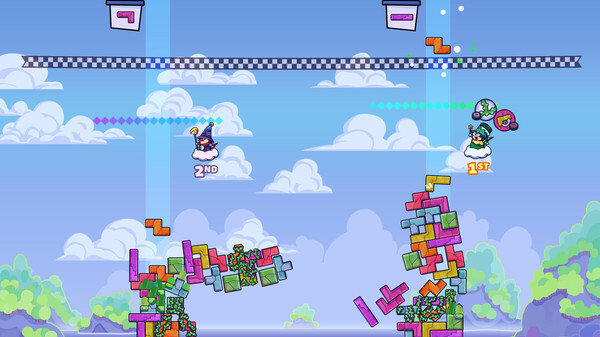 Tricky Towers first launched for PlayStation 4, PC, Mac, and Linux in August 2016, followed by Xbox One in September 2017. Conjure up your wizard’s tower; cleverly stack your summoned blocks and use over 17 different spells to build the trickiest tower! Undermine your rivals; use dark spells to hamper or even push over your competitors’ towers, but beware – they can use these spells on you as well! Match your wizardry online; play with up to 4 players locally or online in one of the 3 game modes available – survival, race and puzzle. Become the archwizard; climb up the leaderboard and see how you rank among your peers.